The article is devoted to the conceptualization of the notion of “Word” in the language of Russian traditional spiritual culture. Offering extensive dialect material, the author argues that “Word” in it is laden with sacred, social, ethical, axiological, magic and aesthetic senses, and explains the reasons of such riches of this notion. 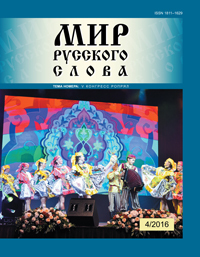 Keywords: Russian traditional culture; dialects; concepts. Based on criteria of standardization / non-standardization of the iconic and verbal components and of their semantic unity, the article describes formal and semantic types of instructive texts. The author reveals the composition- and meaning-based types of polycode instructive texts on the basis of the correlation of the intentional and content-based core of the instruction with the way it is implemented in the text. Keywords: polycode text; instructive units of speech; typology. The paper proposes some results of contrastive analysis of modality fields in Russian and Chinese languages, and offers a model of modality in the Russian language. This model is founded on general scientific logical method of dichotomous classification, known in linguistics as “method of oppositions”. Opposite values of different levels form the tree of oppositions. Models of this type are widely used in functional communicative grammar, being convenient for systematic presentation of the linguistic means of conceptual categories’ expression. The model presented here is not only an attempt to communicate the most important calculations of modal meanings, but is also trying to explain the intercategorial interaction of modality and voluntivity in the area of “necessity — irrelevance”. Keywords: linguodidactics, functional and semantic category of Russian language, functional and communicative pedagogical model of Russian language, syntactic modality. The article describes the texts of Russian media discourse containing the word “primaries”. The relevance of this research is due to the fact that in the spring of 2016 “primaries” became the word of the moment, and its characteristic features included three aspects of the word’s existence, textual, lexical and grammatical ones. The author is using content and discourse analyses of media texts, and shows how the word and the concept are entering to the real communication, in particular to the dialogues of a journalist with his addressee; the latter uses this word in the comments. Keywords: primaries; media discourse; genres; comments; appraisal; mediatization policy. The “Fashion sentence” talk show is a TV program, intending to accuse and to give an advice and precaution to their female guest about changing her appearance. 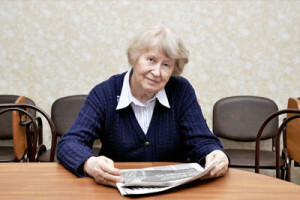 These intentions are to be realized by the “prosecutor” Evelina Khromchenko, whose goal is to assure the guest to get changed in accordance with her age, physiology, colour type etc. The process of persuasion is based both on visual and linguistic means, corresponding with these intentions. Кеywords: speech behavior; speech genre; intention; talk show. The article deals with the specifics of inference in cultural contact from the point of view of cultural contextuality. The author shows that the risk of an incorrect inference increases when interacting cultures have varying degrees of contextuality or when both are of high contextual type. The author demonstrates that the Russian language is capable of carrying implicit meaning and thus allows for varying inferences. Keywords: cultural contextuality; interpretation; inference. This article investigates the semantics of Russian and Lithuanian zoonym phraseology with the ‘sobaka / šuo’ component, its semantic and structural systematization, and the linguocultural peculiarities of phraseological units containing this component in the linguistic view of the world of Russian and Lithuanian native speakers. Keywords: zoonymic component; phraseology; Russian language; Lithuanian language; world view. The article deals with relations of rhythm and sense in poetry. Any verse text comprises semantics components which the poet is aware of — theme, problem, key image — as well as those which appear unintentionally, such as the poetical meter, borrowed from the poet’s predecessors. Starting a poem, the poet sometimes chooses the verse form imbued with traces of literary memory. Keywords: theory of verse; poetics; literary interrelations; analyses and interpretation. The article deals with irony as a form of the comic, the main features of which are implicative character, the presence of the evaluation component and the subjective nature. The essence of ironic statements is based on associativity of connotative language sign. In a literary text irony explicates the author’s outlook, his position and critical attitude to reality. In Gogol’s comedy “The Government Inspector” irony is playing a special role as an expression of the implicit author’s evaluation of the characters and events, and is updated by the variety of language and text means. Keywords: literary text; implicit evaluation; irony; language and text means of irony explication. The article deals with individual stylistic features of Mikhail Veller’s prose cycles. The writer is bringing speech, rhythm, visual features into his text by combining the stories into the series, and each artistic whole into the single cyclic space. In his cycles Veller shows a specific communication strategy, which implies a special language, including intonation and rhythmic characteristics. Keywords: Mikhail Veller; cycle; style; story; novel. The article describes the intersubject teaching system of Russian language, and its linguodidactic support in some school disciplines, presenting also the content of linguodidactic support of school disciplines, its organization and specifics of implementation. Keywords: intersubject teaching of Russian language; linguodidactic support of school disciplines; school educational environment. The article contains an analytical review of ideas and methods in the field of foreign language acquisition proposed by a well-known ESL specialist Norbert Schmitt, which are remaining useful for the theory and practice of RFL teaching. The authors are discussing the classification of foreign vocabulary learning strategies, including its universality, as well as the notion of “formulaic language” and its didactic value. The methods for compiling frequency- and part-of-speech-balanced Vocabulary Level Tests are presented. As a whole, N. Schmitt’s research and teaching developments are regarded as an example of level-based structuring of language material considering both short-term and long-term foreign language acquisition goals. Keywords: vocabulary acquisition; Norbert Schmitt; ESL; Russian as a foreign language; vocabulary learning strategies; vocabulary tests. The article analyzes the concept of “implication” and “inference” in contemporary cognitive and discursive linguistics. The implication and inference are considered as cognitive operations of extracting meaning for the linguodidactic purposes. Keywords: implication; inference; implicature; initial phase of training; advanced training phase. The paper presents the development tree of the theme “Russian Aspect and the Verbal forms: Participle & Adverbial Participle” in the multistage testing TRFF system. Tracing the lines of gradual theme broadening in the spheres of Personal and Impersonal Verbal forms leads to the concrete methods of filling the observed gaps. Keywords: development tree; verbal aspects; participle & adverbial participle; multistage representation; personal & impersonal verbal forms. The author offers the verbs with ornithological component to be used as a material for RFL teaching, and demonstrates their component analysis, able to find out some ornithological image in each verb; the methods for working with this material in foreign class are also provided. Keywords: ornithological verbs; inner image; national peculiarity; stylistically marked words. Strel’chuk E. N. Russkaja rechevaja kul’tura inofonov: lingvodidakticheskij aspekt. M.: RUDN, 2016. 356 s.
Weg zum Erfolg 1, 2 / Blum T., Gorelova E. Wien: Facultas, 2014, 2016. The paper analyses screenplay’s dialogue with classical Russian literature, the value of Russian adapted screenplay as verbal text, its relations with other text types, strategies of its transposing into the new genres. Literary cinematography is understood as the main interpretation resource and the characteristic of texts with montage-driven composition technique, where the visual images are represented dynamically through various, primarily compositional and syntactic means. Keywords: screenplay; Russian literature; text; literary cinematography; adaptation; interpretation; dialog.